In the absence of any solid intel at the moment, it’s time for the usual “interesting things” on social media post, where we speculate on peculiar things we see the pros/possible celebs doing on social media that might suggest they’re a part of this season of DWTS. There were so many people that hit me up with messages on Twitter and IG, so I apologize if your name’s not mentioned…I kinda just want to get this post up, and I didn’t have the energy to sort through my @ mentions and DM’s and try to credit each item individually. Just know that if you helped point any of this out to me, I am grateful! 🙂 Read more.. I had mixed feelings upon hearing about the spinoff – and if I’m being honest, my feelings are still pretty mixed – but at the very least, I think having a brand new set of pros, judges, and celebs (and perhaps a bit of a new format, to accommodate the unique nature of casting kids) might give me a bit of a reprieve from the manipulative grind of the regular DWTS. And the fact that all of the pros are gonna be brand new? Makes it hard for producers to play favorites 🙂 But I do worry about seeing young kids face rejection on national television, especially after seeing young kids cut on World of Dance this summer…I just hope the producers know they have to handle them far more gently than they do the adults on DWTS. So all that being said – who do I want to see as pros and celebs on the show? Well, given that they haven’t really specified what the age range will be, I am gonna guess that anyone under the age of 18 is probably going to be eligible to be a pro or a celeb partner – similar to the competitive ballroom world, where 18 is more or less the cutoff for dancing in the youth division, and then they make you just start doing adult amateur events. Yes, I’m aware that Willow Shields was only 14 when she did the regular version of the show – but if we cut it off at 14, we actually lose some potentially good pro and celeb choices, and I don’t think the show is going to be able to afford to be THAT picky. So 18’s my cut-off, and all of my picks won’t turn 18 during the airing of the show, either. I was also realistic – I doubt we’re gonna see the children/siblings of any huge, A-list celebs on DWTSJ. So yeah – no Jolie-Pitts and the like on this list. I listed celebrity children that I think the show actually stands a chance of possibly getting. I find myself caring more about the pros than the celebrity contestants (although there’s two celebs that I’ve already picked out pro partners for… 😉 ), but I had a good time compiling this list nonetheless. Let me know what you think 😉 Read more..
PureDWTS Season 24 Court Rants: I Don’t Care How “Rabid” Your Fanbase Is, You Won’t Win Without the General Audience Vote! For the regulars, you probably have witnessed what prompted this rant 😛 For the non-regulars, bear with me: it seems like every season, there is at least one fanbase that just bugs the ever-loving sh*t out of me – and it’s usually because said fanbase decides to obnoxiously remind the entire online DWTS fandom how awesome their favorite is, and how they’re going to win, and how they’re sooooo much better than other contestants, and how much harder they’re gonna vote than all the other fans, how rabid & supportive the fanbase is, etc. Basically – if they can think of something to boast about, they will. Loudly, frequently, and obnoxiously…and the rest of the fans just have to grit their teeth and bear it until the season ends or that particular contestant gets eliminated. You cannot win DWTS if you don’t have the main viewing demographic of the show on your side. In this new E Online interview with Candace Cameron Bure, she talks about Fuller House Season 2, but, she also dishes on Jodie Sweetin and how she’s currently handing her injury and the pressure of doing Dancing With The Stars. She’s so proud of Jodie. See why below. Read more.. Check out Candace Cameron Bure. Today was her birthday and she danced with Maks And Val Chmerkovskiy to open The View. They interview with Maks and Val too. Thanks to @Idolxfactor1 for recording. GMA did a live stream tonight with Tony and Melissa talking to all the finalists. This is where we are getting tiny little glimpses of what their judges redo dances might be. So far, Bindi MIGHT have quickstep and Carlos MIGHT have foxtrot. Lindsay apparently straight up said they were doing Waltz. First up is Alek and Lindsay, followed by Bindi and Derek and the rest. Lindsay talks alot about the dances and their freestyle. Sounds like it’s going to be lift heavy, which is his strong suit but which may backfire. Candace Cameron Bure decided to focus her new book, “Dancing With the Stars, Dancing Through Life: Steps of Courage and Conviction” about her experience on Dancing With The Stars, dealing with modesty, and leaping out of her comfort zone. Below are a few questions she answered for Time. Why did you decide to write a whole book about your Dancing With the Stars experience? Bure: Two reasons. After doing that show, I learned so much about myself in such a short amount of time. Each week really was filled with these huge life lessons, which I didn’t think I could learn at the age that I’m at. So that in itself was quite a shock and surprised me. And the other reason was that I had wanted to write a book about conviction, and yet I never felt that I had the right platform to write it. So after DWTS, it was the perfect place to write about courage and conviction, and then share the experience and all the life lessons. I was actually scheduled to write a book on a different topic, and after I had done DWTS, a week later I called my publisher and said, “Hey, can we switch gears? Because I really want to write about this and I think it would be perfect, and it’s so fresh in my mind, let me just do this,” and they were on board. You write about struggling with modesty on Dancing With the Stars. What do you think is the biggest misconception about Christian womanhood in America? I think that so many people—and it can be both people of faith and secular people—I feel like things are often put to the extreme one way or another, and there’s not a lot of common sense that goes along with it. It’s like you hear from people that aren’t Christians, and when they mock you, they want to say, “Oh, shouldn’t you be in a turtleneck and something covering your ankles?” That’s not silly in certain cultures, but for living in America, obviously that’s something that’s said with such sarcasm, they’re trying to get at you. And yet within Christians, everyone has a different set of standards, and that’s why it was important for me to say, “Hey, these are what my convictions are, you may not agree with my conviction as a Christian, but at the end of the day, I will stand before God on my own, you’ll stand before God on your own, so if you have a different standard, great, you’re gonna talk to him about it, I’m gonna talk to him about it, I’ll have to deal with my own consequences.” That’s where I stand, but I feel like the biggest misconception about the word “modesty” in general is just that it’s restricted to hemlines and necklines and clothes, when modesty is so much more about our character, and the way we carry ourselves, and the way we speak and act. That was the thing that I wanted to get across the most, because the Bible doesn’t really talk about hemlines. Good for her!! I loved her on Dancing With The Stars. To read more of the interview, see Time. You can order her new book at this link. 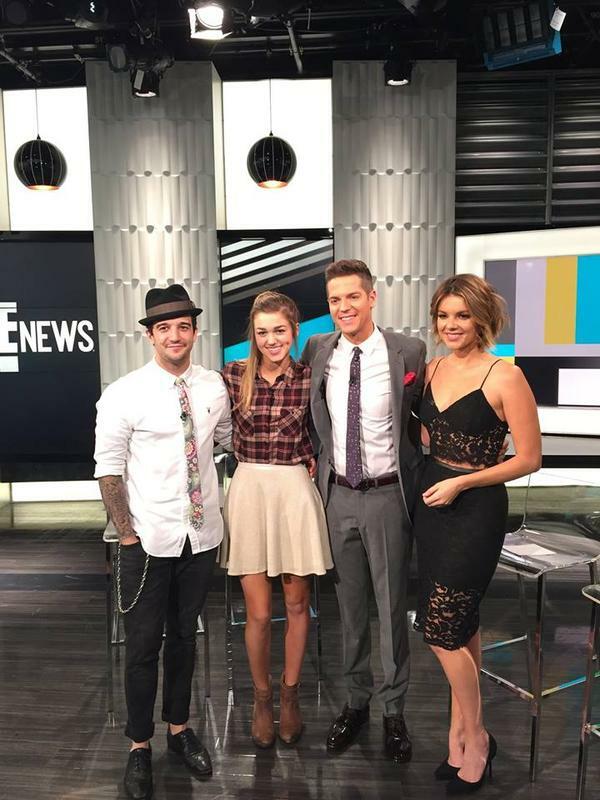 Mark Ballas writes of how Sadie Robertson got sick and wasn’t feeling the best on Monday night during Dancing With The Stars at Hollywood Life. However, Sadie carried on and they ended up getting 2 10’s for their second dance. He was so proud. Below are some hints for the Finals. We have a really nice piece planned for Sadie’s final number, and I think people are really going to enjoy it! The music is going to start, and I think everyone is going to identify with it because it’s so iconic. It’s judges’ pick next week, which means the judges will choose any of our past performances that they really enjoyed that they would like to see again. So they will be telling us which one of our dances they would like for us to repeat! This week’s game-plan is to not change anything up and just keep doing what we’ve been doing. If it ain’t broke, don’t fix it! We want to enjoy each other’s time and company — it’s the final week that Sadie and I will spend together in this competition, and we want to have a really good time. We’re going to bust a sweat and work hard, but we won’t lose sight of what’s important. If you’d like to read more, see Hollywood Life. They have some fun backstage pictures too. And below is a fun flashback. Apparently, Mark’s previous partner Candace Cameron Bure wore Read more..
It’s “definitely going to be a brawl in the last two rounds,” Ballas dished to E! News when he and Robertson stopped by the studio on Friday, where they also chatted about Sadie’s headline-making costumes (for more on Sadie’s Duck Dynasty-approved looks, be sure to watch E! News tonight). But despite killing much of their competition, Sadie admitted that she’s far more nervous now that it’s down to the final five couples. So who did she turn to after experiencing a memory slip on stage last week? None other than Mark Ballas’ former partner (and fellow conservative star!) Candace Cameron Bure. ETA: Here is the full interview…. PureDWTS Season 18 End-of-Season Awards – Which Song Choice Was the Worst? 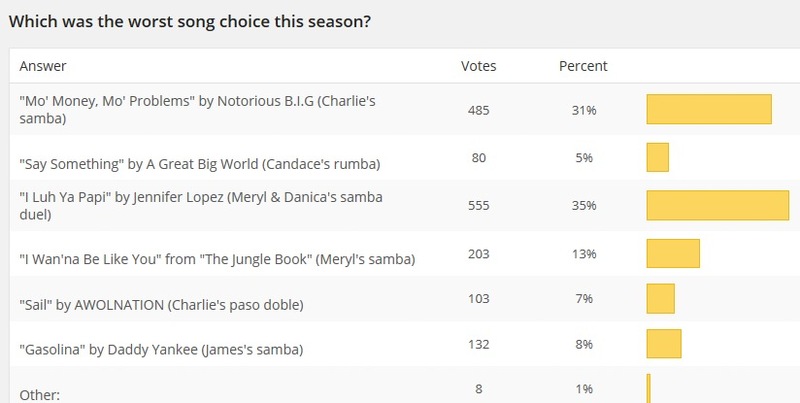 So you’ve seen the results for the best guest judge voting – now onto the results for the crappiest song of the season!!! Heidi: I ain’t takin’ that bet, Courtney. Same kinda idiot who haunts Amy’s instagram to scream “Meryl and Maks! !” on every single photo that Amy posts. :::rolls eyes::: Must protect Princess Meryl at all costs!! My nickname is an inside joke…wish I could say the same for Meryl’s. But no…the pedestal is still very, very high. Meryl overcame so many obstacles on her path to victory…horrendous song choices…mean judges picking on the stellar choreography…oh, wait. 😀 ANYway, JLo was getting a lot of crap on the radio this morning for pretending to be “Jennie from the block” while staying in Manhattan. Apparently she gave 25k tickets to people in Brooklyn for her concert and half of them didn’t show up? With songs like “I luh Ya Papi” can anyone really blame them?? Yes, the song was bad (it got my vote)…but the choreographers did not help at ALL. Lord what a whimpy assed dance. The difference between “Mo Money, Mo Problems” and the “I Wan’na Be Like You” is also totally in the choreographer, IMO. Neither song is a REALLY terrible song choice (but Charlie definitely got the short end of the stick in this instance), but Sharna made the best of it while Maks couldn’t get past it. I can’t help thinking that if Derek or Mark had been handed Maks’ samba song (or JLo’s song), we would have seen some pretty creative choreography. Ah well. Vogue: It’s so funny as when I first heard Charlie had “Sail” for a Paso Doble, I didn’t think it would work, but, it actually didn’t bother me. Give it up to Charlie and Sharna making the best of it….again as they did through out the season. Another song that just annoys me to no end anyway is “I Love Ya Pai”. I cringed through out Danica and Meryl’s Samba duel with that song. However, another song I didn’t like was “I Wanna Be Like You” for Meryl’s Samba. Awful song with a lack luster dance too. In the end, I voted for “I Wanna Be Like You” for the worst song.